17th Street is now available on iTunes, Spotify, Amazon, Google Play, and everywhere else. About This Album: A full-length concept album chronicling a twenty-something’s reluctant move to Atlanta. A collection of personal stories about love, heartbreak, and one young person’s journey to find his place in a beautifully chaotic world. Who Should Listen: Anyone who’s ever moved to a new city, concept album lovers, folks who love supporting local Atlanta artists, and anyone else looking for something new to tickle their ears. 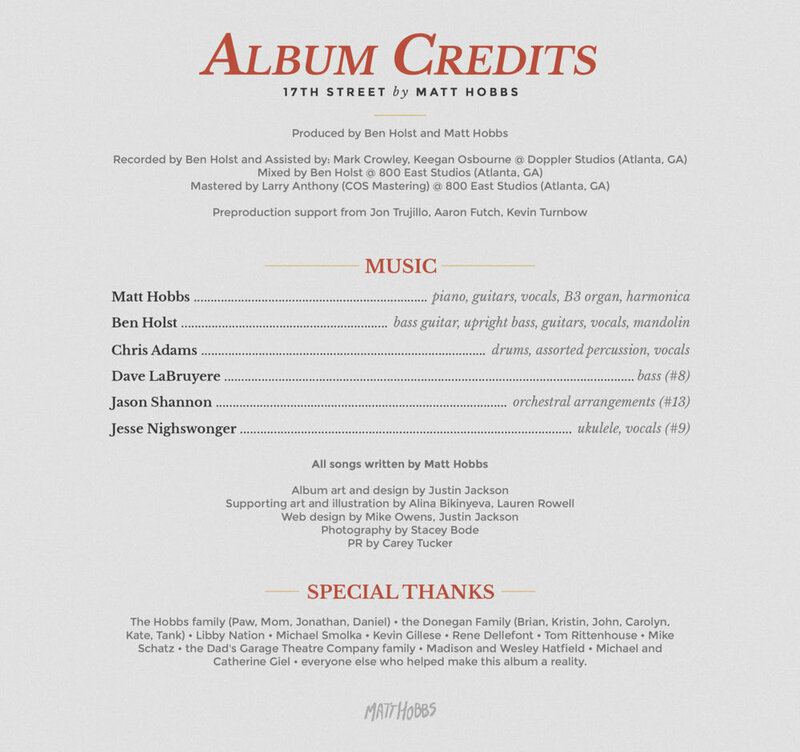 After nearly 5 years of writing and 9 months of recording, 17th Street, the second album by singer/songwriter Matt Hobbs, is hitting digital shelves this summer. A collection of 13 songs, the Atlanta-based artist’s sophomore effort chronicles the tale of a young man’s journey from fresh college graduate to full-on adult. “So many talented people worked on this project. That’s my favorite part of this whole thing: all the awesome folks who have contributed. This album started out as this super rough demo I made in my living room – that was about as far as I could take it alone. The musicians, engineers, designers, coaches, and people who listened and gave feedback during writing – these are the folks that made this record a reality. Because of this amazing collective effort, this album has taken on a life of its own,” explains Hobbs. 17th Street will be released on September 27, 2016 and will be available for free digital download on Gumroad as well as iTunes, Spotify, and limited physical distribution.